Lakes in the Tasmanian Wilderness World Heritage Area (TWWHA) are contaminated with dangerous metals at some of the highest levels in the world. ANU researchers studied airborne contamination for the first time in Tasmania, and found metal contaminants travelled 130km down-wind of historical mining sites in Queenstown and Rosebery. 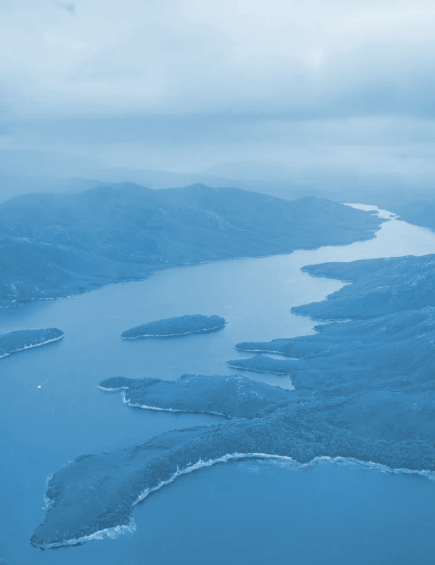 In Tasmania, dangerous levels of lead, copper, arsenic and cadmium were found in all six lakes in the TWWHA region with some exceeding the highest allowable levels in sediment guidelines for Australia and New Zealand. Lead researcher Dr Larissa Schneider and Professor Simon say the high levels of metal concentrations may be cause for health concerns. “This is a very severe contamination and it's very likely that the health of the local biota; bacteria, algae, fish and other organisms is being affected, but as this aspect hasn't been studied, we have no way of knowing,” said Dr Schneider. Dr Schneider said the Tasmanian contamination is on par with that in the Kurang River in Pakistan, contaminated by mining and the Shur River in Iran, subject to heavy metal pollution from non-mining activities such as waste dumping. “I was very surprised by the high concentration results. When we compared the confirmed results with worldwide sites, we found that Tasmania's metal concentration levels were one of the highest ever reported,” said Dr Schneider. “We tested a number of metals and metalloids including selenium where a study in the US proved that lower concentrations than the ones found in Tasmania had affected the ability of fish to reproduce. “It's even worse with Mercury and Lead which cause deformities in the offspring of affected fish. Some elements can also be carcinogenic so all this could be happening in Tasmania in an area we think is safe because of its world heritage listing,” said Dr Schneider. The researchers used a new model to help understand the interplay of climate factors on airborne metal distribution. The Hybrid Single Particle Lagrangian Integrated Trajectory (HYSPLIT) predicted how far the contamination travelled and sediment samples taken from places 130km away from the mining sites confirmed the modelling.